Oregon Trail, an operator of seven John Deere implement dealerships, merged with Landmark effective January 1st. The merger expands Landmark’s network to 17 locations in Nebraska and Kansas and is expected to double its sales and service area. 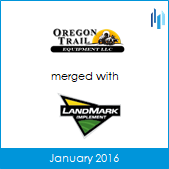 Skyline Advisors (formerly CFO Capital) served as a strategic advisor to Oregon Trail Equipment during the merger discussions.